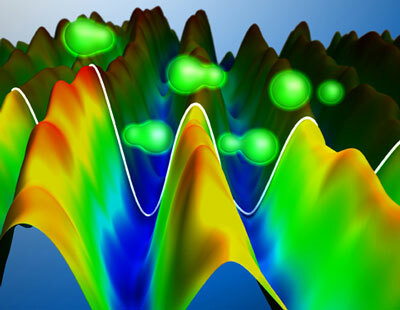 (Nanowerk News) For the first time ever, a European research team has managed to use attosecond laser pulses to observe the motion of electrons in molecules. This report is published in the journal Nature ("Electron localization following attosecond molecular photoionization"). In order to not only observe, but also really understand a chemical reaction, scientists have to know how electrons move within molecules. Until now it was technically impossible to observe how electrons move within a molecule, because they move so incredibly fast. However, a group of European researchers has now achieved this goal with the help of attosecond laser pulses. An attosecond is a billionth of a billionth of a second. During an attosecond, light covers a distance of less than one millionth of a millimeter –equivalent to the distance from one end of a small molecule to the other. Physicists are therefore making great efforts to create attosecond laser pulses: using attosecond laser pulses they can "photograph" the movement of electrons within molecules, just like in a photo shoot. In the European research team, Prof. Marc Vrakking, Director of the Max Born Institute for Nonlinear Optics and Short Pulse Spectroscopy (MBI) in Berlin worked together with groups from – among others - Milan, Amsterdam, Lund (Sweden), Lyon and Madrid. Part of this team also included the Attosecond Imaging group of Prof. Matthias Kling from the Max-Planck-Institut für Quantenoptik, Garching (Germany). The physicists examined the hydrogen molecule (H2) – which is nature's simplest molecule, with just two protons and two electrons. The researchers wanted to find out exactly how ionization takes place in a hydrogen molecule. In this process, one electron is removed from the molecule, and the remaining electron undergoes a rearrangement. Marc Vrakking explains, "In our experiment we were able to show for the first time that with the help of an attosecond laser we really have the ability to observe the movement of electrons in molecules. First we irradiated a hydrogen molecule with an attosecond laser pulse. This led to the removal of an electron from the molecule – the molecule was ionized. In addition, we split the molecule into two parts using an infrared laser beam, just like with a tiny pair of scissors. This allowed us to examine how the charge distributed itself between the two fragments – since one electron is missing, one fragment will be neutral and the other positively charged. We knew where the remaining electron could be found, namely in the neutral part." Ever since the 1980s, scientists have been examining molecules and atoms with the help of femtosecond lasers – a femtosecond is one millionth of one billionth of a second, thus a thousand times slower than an attosecond. Using femtosecond lasers, the movement of atoms and molecules can be tracked, but not that of electrons. In 2001, researchers were able for the first time to produce a laser flash with a length of 250 attoseconds. This was followed by considerable efforts on the development of attosecond lasers as well as the control and measurement of the pulses. More recently, scientists are beginning to use the attosecond pulses to address problems in natural science, such as the first molecular application that was published now. Although the European team's experiments with attosecond lasers produced some of the results they had hoped for, there was also one surprise in store for the scientists. In order to be able to interpret the measurements even better, they involved a group of theoreticians from the University of Madrid in the project. The Spanish researchers' work brought completely new insights. Dr. Felipe Morales from Madrid, who is currently working as a postdoctoral fellow at MBI, reports, "We nearly reached the limits of our computer capacity. We spent one and a half million hours of computer time to understand the problem." The calculations showed that the complexity of the problem was far greater than previously thought. "We found out, that also doubly excited states, i.e. with excitation of both electrons of molecular hydrogen, can contribute to the observed dynamics. ", says Matthias Kling. Marc Vrakking describes it as follows, "We have not – as we originally expected - solved the problem. On the contrary, we have merely opened a door. But in fact this makes the entire project much more important and interesting."